Well this appeared in my life rather suddenly. While attending an EL-wire workshop at Endeavour Arts, Catherine asked me if I'd like to team up and create a dress for Make Fashion, and without much comprehension of what that meant, I agreed. We spent the next two months researching, prototyping, sewing, building, and programming my design into existence. Dianne Gibson [Corsetière] created the corset to fit our model Katherine E Mandolidis perfectly. Catherine Hazin [editor of Luxe, by Calgary Bride] created the dress and spent countless hours sewing on feathers. And Lia Golemba hand cut the leaf pattern for the bustle. I started out by researching on methods for manipulating light and I found fiber optics to be rather beautiful. They mitigated the need for having wires run all over the dress, but instead pumped light through almost invisible tubes. 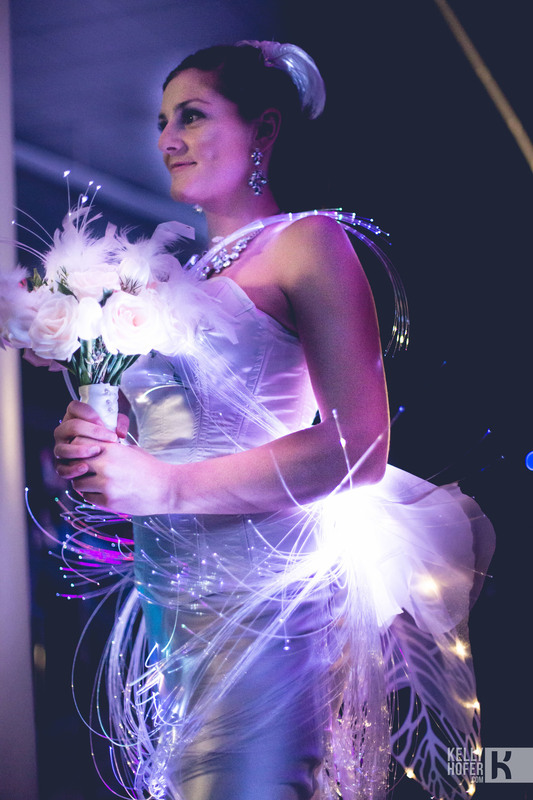 The LED's had to be programmed to emanate a pulsating pattern created from the heartbeat of the Bride. A gentle wave of light washed down the dress with every beat of her heart. That pattern was triggered by a Pulse sensor, processed using a Xadow Arduino computer which lit up 90 individual LED's to light up the fiber-optics. The making of the dress was supported by Make Fashion which were sponsored by OnConference, SparkFun Electronics, WestJet and Seeed Studio. -It has over a kilometer of fiber optic. -It takes 10, 3D printed enclosures to hold the LED's and fiber optics. -There are several thousand feathers hand-sewn to the dress. -The corset was hand made to fit the exact measurements of our model. -300+ man-hours were required to conceptualize, prototype, and create this dress. - 3 batteries are required to keep all the lights lit up, and it will run for several hours. We had many design challenges. Key among them was working with fiber optics. Finding ways to align them and ensure maximum light transmission took days to trial and error. There were simply no guides online that showed how to mate the ends of the fibers with lights without requiring expensive lens assemblies. Our biggest challenge was time. We had ideas aplenty, but time so little. I wanted to include wireless charging capabilities, make it water resistant, use fiber optics in entirely different ways, use better feathers like those of ostriches, bleached pheasants, and other assortments of white fluffery. I would also love create a housing array for the lights that is beautiful enough to have entirely exposed, in a different location, and beautiful in itself. We plan to keep on producing similar dresses for brides, made to order. Contact me at kellyhofer@gmail.com if you have questions or would like to discuss how you can get one for yourself and how you'd like your's to be unique. Video and better photos will come within a month. And more exciting projects and dresses, possibly mens-wear as well, within a year. Click thumbnails below to view large.